Set on the northern shore of Banderas Bay, the all-suites Paradise Village Beach Resort and Spa is on a 274.5m (900-ft) stretch of sandy beach. This family-friendly property is in Marina Vallarta, 5 km (3 mi) from downtown Puerto Vallarta, with direct access to both beach and marina. If you're looking for a great (and cheap!) hotel in Puerto Vallarta, CheapTickets is the best place to find them. We offer deals on the best 453 hotels throughout Puerto Vallarta. No matter what you're looking for, we have options for you. Grab great rates on the 175 affordable 3-star hotels that are easy on the wallet without sacrificing comfort. Looking for more luxury? Try one of the 78, 4-star hotel accommodations in Puerto Vallarta. No matter your budget needs, we've pulled out all the stops to make sure you have plenty of vacation options. Maybe you prefer to search for your hotel deals based on what each hotel offers? For example, let's say you just want to find a hotel or resort that has a pool to cool off in after a long day exploring Puerto Vallarta. Scroll down to choose from the 139 hotels in Puerto Vallarta that has a pool for guests. Or search for deals on Puerto Vallarta hotels offering free wifi or breakfast, non-smoking rooms, and more! CheapTickets is here to be your personal travel agent for your next trip to Puerto Vallarta. Get booking today! What hotels in Puerto Vallarta offer free wifi access? Are there deals on Puerto Vallarta hotels offering free breakfast? Yes! The only thing better than finding a great deal on a cheap hotel in Puerto Vallarta is finding one that offers free breakfast. Grab some eggs, a waffle, or some healthy oatmeal before a day full of exploring Puerto Vallarta and all that it has to offer. Below are just some of the many hotels that offer free breakfast in Puerto Vallarta. Buenaventura Grand Hotel & Great Moments - All Inclusive is a 4.00 star rated hotel property in Puerto Vallarta that offers free breakfast. Sheraton Buganvilias Resort & Convention Center is a 4.00 star rated hotel property in Puerto Vallarta that offers free breakfast. 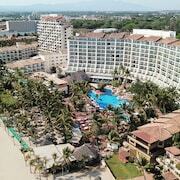 Riu Jalisco All Inclusive is a 3.50 star rated hotel property in Puerto Vallarta that offers free breakfast. Royal Decameron Complex All Inclusive is a 3.00 star rated hotel property in Puerto Vallarta that offers free breakfast. What about deals on pet-friendly hotels in Puerto Vallarta? Puerto Vallarta is a great place to get outside and explore with your pets in tow so don't leave your furry friends behind. Below you'll find great deals on hotels in Puerto Vallarta that allow pets. Don't forget to bring plenty of treats! Pinnacle Resorts 180 is a popular, pet-friendly, 4.00 star hotel in Puerto Vallarta. Riu Vallarta All Inclusive is a popular, pet-friendly, 3.50 star hotel in Puerto Vallarta. Riu Palace Pacifico All Inclusive is a popular, pet-friendly, 4.00 star hotel in Puerto Vallarta. Barceló Puerto Vallarta - All Inclusive is a popular, pet-friendly, 4.00 star hotel in Puerto Vallarta. Any good rates on Puerto Vallarta hotels with restaurants? Absolutely. Don't want to deal with planning our all your meals on your trip to Puerto Vallarta? We don't blame you. Keep the hangry away by staying in one of the 121 hotels that have restaurants. With a room at one of these spots, all it takes to get a good meal is hopping in the elevator. Check out some of the most popular hotels in Puerto Vallarta that have restaurants below. 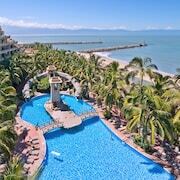 Book Vamar Vallarta All Inclusive Marina and Beach ResortVamar Vallarta All Inclusive Marina and Beach Resort is a 3.50 star hotel and has one or more restaurant options. Book Crown Paradise Golden Puerto Vallarta All InclusiveCrown Paradise Golden Puerto Vallarta All Inclusive is a 4.00 star hotel and has one or more restaurant options. Book The Westin Resort & Spa Puerto VallartaThe Westin Resort & Spa Puerto Vallarta is a 4.00 star hotel and has one or more restaurant options. 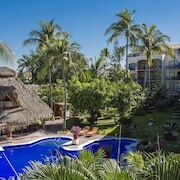 Book Playa Los Arcos Hotel Beach Resort & SpaPlaya Los Arcos Hotel Beach Resort & Spa is a 3.00 star hotel and has one or more restaurant options. What are the cheapest hotels in Puerto Vallarta with pools? What's better after a long day exploring Puerto Vallarta then a relaxing dip in a pool? Finding the Puerto Vallarta hotel you need for a bargain! Cool off and unwind at one of our 139 Puerto Vallarta hotels with a pool. Browse some of the top deals on these hotels and resorts with pools in Puerto Vallarta below, but be warned: You may not want to check out! 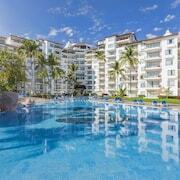 Velas Vallarta Suites Resort All Inclusive has a pool and a 4.00 star rating. Grand Miramar All Luxury Suites & Residences has a pool and a 4.50 star rating. Paradise Village Beach Resort and Spa has a pool and a 3.50 star rating. Hotel Eloisa has a pool and a 3.00 star rating. What hotels in Puerto Vallarta offer parking for guests? Once you've made your way to Puerto Vallarta, the last thing you want to deal with is finding parking close to your hotel. Avoid the hassle of parking around the block and carrying your luggage all the way to the lobby by booking one of our hotels with parking. Check out deals on some of the 125 hotels in Puerto Vallarta that offer parking for guests. Hotel Tropicana This hotel has a 3.00-star rating. Fiesta Americana Puerto Vallarta All Inclusive & Spa Hotel This hotel has a 4.00-star rating. 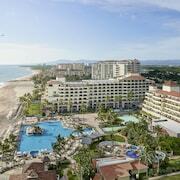 Dreams Villamagna Nuevo Vallarta All Inclusive This hotel has a 4.00-star rating. 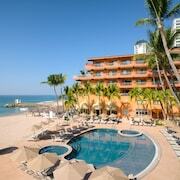 Emperador Vallarta Beachfront Hotel and Suites This hotel has a 3.00-star rating. Do Puerto Vallarta hotels offer 24-hour concierge services? When you're on vacation, things don't always go according to plan. Travel with peace of mind when you book one of our 113 hotels in Puerto Vallarta with 24-hour concierge service. That way you know help is always phone call or elevator ride away. Try Now Amber Puerto Vallarta Resort & Spa - All Inclusive. It's a 4.50 star rated hotel in Puerto Vallarta that offers concierge services 24 hours a day. Try Secrets Vallarta Bay Puerto Vallarta - All Inclusive. It's a 4.50 star rated hotel in Puerto Vallarta that offers concierge services 24 hours a day. 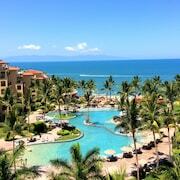 Try Villa Del Palmar Flamingos Beach Resort and Spa. It's a 4.00 star rated hotel in Puerto Vallarta that offers concierge services 24 hours a day. Try Meliá Puerto Vallarta All Inclusive. It's a 3.50 star rated hotel in Puerto Vallarta that offers concierge services 24 hours a day. What about low rates on non-smoking hotels in Puerto Vallarta? Costa Sur Resort & Spa This hotel has a 3.50-star rating. Plaza Pelicanos Club Beach Resort All Inclusive This hotel has a 3.00-star rating. Playa Los Arcos Hotel Beach Resort & Spa This hotel has a 3.00-star rating. What are the cheapest Puerto Vallarta 3-star hotel deals? Our 3-star hotels bring you quality accommodations at a lower price point for the perfect, budget-friendly vacation in Puerto Vallarta. With 175 3-star hotels throughout Puerto Vallarta to choose from, you still have options. Browse our selection below. Riu Vallarta All Inclusive. This Nuevo Vallarta hotel sits 9 miles from Puerto Vallarta and 3 miles from Splash, a water park; it is within 3 miles of 2 golf courses. Riu Jalisco All Inclusive. Renovated in November 2013, the Riu Jalisco boasts new family rooms, an extended lobby, exciting gastronomic options, and a splashpool for kids. The hotel is located in Riviera Nayarit Nuevo Vallarta, right on the seafront of Playa Flamingos. Friendly Vallarta Beach Resort & Spa All Inclusive. Conveniently located in Puerto Vallarta's hotel zone, this family-friendly beachfront resort is a five-minute drive from the cobblestoned streets of the downtown area; the airport is a 10-minute drive away. Playa Los Arcos Hotel Beach Resort & Spa. Overlooking the Banderas Bay with direct beach access, this Puerto Vallarta resort is in the Romantic Zone, a 5-minute walk to downtown and about a 20-minute drive to 3 golf courses. 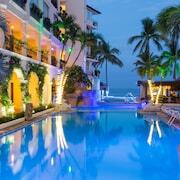 What are the best deals on 4-Star Hotels in Puerto Vallarta? Puerto Vallarta is full of hotels and it can be hard to narrow down where you really want to stay. Luckily, we've done that hard work for you be narrowing you from 453 hotels throughout Puerto Vallarta, to the 78 4-star hotels in Puerto Vallarta. Our 4-star hotels in Puerto Vallarta are exactly what you need for your next family trip, romantic weekend, or solo getaway. Check out our most popular deals below. Crown Paradise Golden Puerto Vallarta All Inclusive: This beachfront resort for ages 18 and older is on Banderas Bay, just 2 blocks from the Marina Pier cruise-ship port with shops and restaurants, and 4 km (less than 3 mi) from downtown Puerto Vallarta. Hyatt Ziva Puerto Vallarta - All Inclusive: Nestled on the beach, this Conchas Chinas resort is 1.5 mi (2.4 km) from Los Muertos Pier and 2.5 mi (4 km) from Malecon. Playa de los Muertos and Galeria Olinala are also within 2 mi (3 km). Riu Palace Pacifico All Inclusive: Nestled on the beach, this Nuevo Vallarta resort is 1.2 mi (2 km) from Playa Bucerias and 2.2 mi (3.5 km) from Flamingos Golf Club. Nayar Vidanta Golf and El Cora Crocodile Sanctuary are also within 6 mi (10 km). Fiesta Americana Puerto Vallarta All Inclusive & Spa Hotel: Within a 10-minute drive of Fiesta Americana - Puerto Vallarta, guests can watch the boats come in at the picturesque marina, and see the sun set over the Bay of Banderas. The pedestrian shopping precinct of Plaza Caracol is a short walk away, and El Malecón Boardwalk makes for a pleasant stroll. What are the best activities to do in Puerto Vallarta? Pirates of the Bay Sunset Cruise: Starting at just $120 per person. Pirate Land Adventure: Starting at just $77 per person. Jungle Canopy Zipline Tour: Starting at just $60 per person. Guided City Tour with Lunch & Tequila Tasting: Starting at just $49 per person. Located close to everything. Beach, Central Plaza, Melecon Buses to city and buses to Mismaloya and Boca. I liked everything, the food is excellent, the staff is very nice! Walking distance from Marina and restaurants. Quite place but close from the action .